Under United States laws, all fireworks are classified between 1.1G and 1.4G, with the vast majority falling under the 1.3G or 1.4G rating. This refers to their specific Hazard Division within Class 1 Explosives, Compatibility group G. Fireworks that are classified as 1.3G are professional display fireworks, while those that are classified as 1.4G are consumer fireworks. Here is what you should know. Class 1.3G display fireworks are not for sale to the general public, as they exceed the maximum amount of explosive materials that consumer fireworks can contain. They are designed for professional fireworks technicians who have undergone specialized training and carry up to date licenses. There are stringent restrictions regarding the sale, possession, storage, and use of display fireworks. These are the fireworks used in professional shows put on by theme parks, cities, and other large organizations for the benefit of numerous patrons. They are not legal or safe for members of the public to possess or use. To receive a rating of 1.4G, fireworks may contain no more than 50 mg of flash powder (ground effects) or 130 mg of flash powder (aerial effects). In addition, there are specific restrictions on the chemicals that may be used to create consumer fireworks, and some chemicals are specifically prohibited due to their volatility. Because they are less volatile than display fireworks, the importation, distribution, and storage of 1.4G fireworks are not regulated at the federal level. However, anyone manufacturing consumer fireworks in the United States must obtain a federal license to do so. Note that 1.4G is a federal designation. It does not guarantee that a particular effect is legal in any given state, county, or city. In fact, only a handful of states have no fireworks law stricter than federal law. Some states and municipalities ban all consumer fireworks regardless of type. 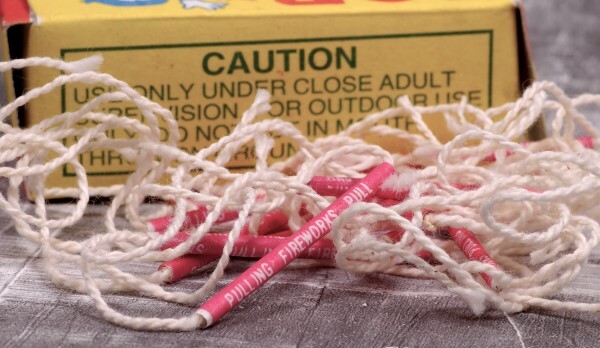 Any fireworks that are labeled 1.3G are definitely illegal, as are M-80s and similar items. However, the responsibility falls on you to find out whether the fireworks you want to purchase and use are legal in the place you plan to hold your show. Always research the relevant laws before making your selection. Even if a particular fireworks effect is labeled 1.4G and is legal to use in your area, it might not be safe to use in the area you have designated. It is vital to search for hazards, create a perimeter with enough space between the launch point and the audience, use safe handling techniques, and ensure that there is a clear path from the launch point to the place in the sky where the effect will explode. If you have any doubts about your ability to safely launch a particular effect, err on the side of caution and leave that effect out of your show. At Dynamite Fireworks, we don’t only sell top-quality, name-brand fireworks. We also provide the information you need to know to use them responsibly, legally, and safely. If you have any questions or concerns, give us a call at (219) 937-4090. We look forward to becoming your one-stop shop for all your fireworks needs!